Required rates of return for solar projects are going up, and that's hitting solar developers on the bottom line. 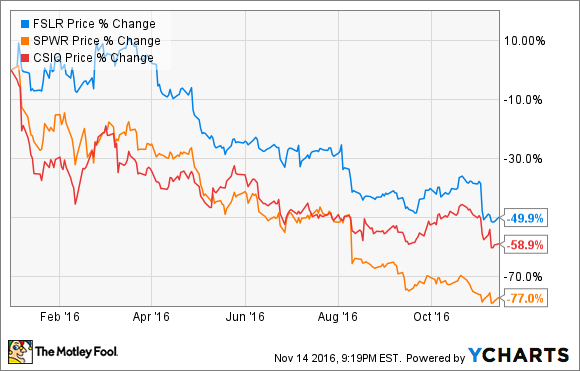 2016 has been a pretty terrible year for solar stocks, with the entire industry down. The biggest shock may be that leaders like First Solar, Inc. (NASDAQ:FSLR), SunPower Corporation (NASDAQ:SPWR), and Canadian Solar Inc (NASDAQ:CSIQ) have all seen stock prices plunge as well. A lot of factors have hurt solar companies, from falling panel prices to a lack of demand for projects in 2017. But what shouldn't go overlooked is the decline in project prices as buyers demand higher returns on solar projects. And the price 8point3 Energy Partners LP (NASDAQ:CAFD) just paid for a project from First Solar shows just how far the industry has fallen. Solar project developers depend on utilities, yieldcos, and other investors paying a price for solar projects that will be profitable for them. One way we can see how solar project pricing and rates of return are changing is to look at the purchase price and expected annual cash flow from projects over time. This year, 8point3 Energy Partners has made three major project purchases from SunPower and First Solar -- and you can see that rates of return have been on the rise all year. Data source: 8point3 Energy Partners press releases and earnings presentations. The timing of specific cash flows from each project and assumptions within the pricing model aren't known, so the rate of return difference between Kern and Stateline might be less than 2% on 8point3 Energy Partner's internal model. But we can generally assume that required rates of return are going up and the value of projects is going down. This is great for 8point3 Energy Partners' ability to buy projects accretively, but it's a negative impact for First Solar, SunPower, and Canadian Solar selling projects. We've recently seen disappointing results from First Solar and SunPower, along with fairly unimpressive guidance, and this trend in project pricing can be blamed directly. Given the figures above, if Stateline, for example, had an implied rate of return of 7.7%, it would have been worth $415.6 million, an $86.1 million increase from what it was sold for. This would have directly benefitted First Solar's bottom line. If project rates of return continue to rise, it could result in difficult economics for solar project development. That could be one reason First Solar and SunPower have said they'll move into more component sales, taking less risk on projects maintaining a low rate of return to create value. No matter what part of the solar market you're investing in, it's important to understand how rates of return affect project prices, because they can drive profits and losses very quickly for solar companies.